This spring, Great-Grandpa planted numerous pumpkin seeds in the garden. They took over his garden! The kids were able to watch the plants grow, see the pumpkins form and watch them turn from green to orange. When the vines started to dry out we picked a few pumpkins to take home. We also discussed how two years ago Grandma left her jack-o-lantern outside to decompose in her flower bed. 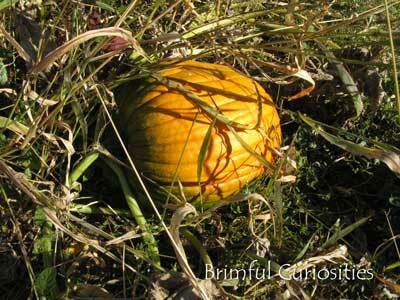 The next year a pumpkin vine grew from the rotten pumpkin. She must have left a few seeds behind when she cleaned it before carving! The book Pumpkin Circle mentions decomposition, too. My daughter told us that she learned in school that a pumpkin is a fruit. We examined the inside of a pumpkin. Both kids like touching and pulling out the inside mass of string and seeds. Every year our family carves pumpkins, but we've never tried counting the seeds inside. This year we were inspired by the book How Many Seeds in a Pumpkin? by Margaret McNamara and G. Brian Karas. We picked two pumpkins to compare, a small and large one. We estimated how many seeds were inside. My daughter thought the big one would have 120. I thought around 350. We were both wrong. 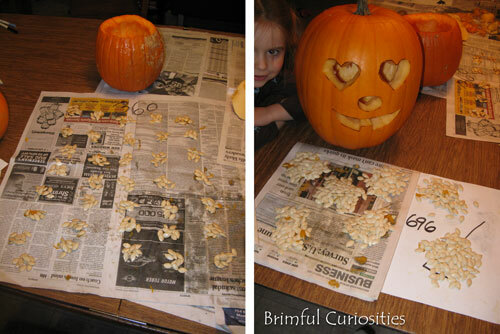 My daughter and I grouped the seeds from the small pumpkin into piles of 10 seeds. Daddy grouped the big pumpkin seeds into piles of 100 seeds. (My son tried to help with this, but he kept messing up the piles. We gave him a spoon and the pumpkin insides to play with and he happily transferred the mush into the pumpkins and back out during our counting period.) After counting we discovered that the large one contained 696 seeds. The small one contained 360 seeds. 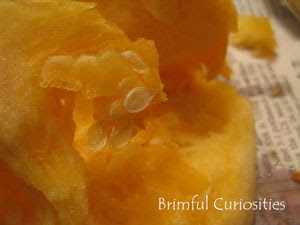 In McNamara's book the smallest pumpkin has the most seeds, unlike our result. Some of the seeds were not fully formed. We did not add these seeds to our final count. We only used the white seeds (the ones suitable for roasting). This week we're also participating in Math Monday hosted by Joyful Learner. Math is fun, too! Great (timely) idea! I was trying to get my son interested in carving his pumpkin, and he didn't want to, and I decided I really wanted to make roasted pumpkin seeds... my son is super picky about eating (nothing with a sauce, no pasta or anything mushy, etc.). 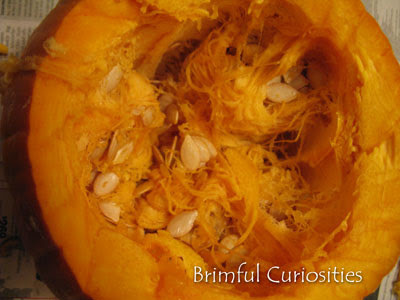 I thought if he saw the inside of the pumpkin, he wouldn't be willing to eat the seeds. So I did it while he slept! It worked - he gobbled them up. Thanks for linking! We have yet to carve a pumpkin this year but we'll be looking for the smaller kind! 600+ is a lot of seeds to count! I hadn't thought about excluding the not fully formed pumpkins. I remember doing that with my students one year and there were a lot of pumpkins. Great pumpkin lesson post. I love the heart jack-o-lantern eyes too. What a great activity for hands on learning! Great activity. We painted pumpkins this year, but did not carve any - I have to make sure to do that next year. What a fun experiment! I would love to do it with my son, but I can't seem to talk him into actually touching the insides of the pumpkins!